Викторина PokerStars продлится до 17 декабря. Вы имеете возможность получить билет на турнир за 5$, с гарантированным призовым фондом в 20,000$. Викторина откроется после того как вы запустите клиент PokerStars. Если вы ответите на какой-либо вопрос не верно, то билет не получите. Вопросы основаны на достижениях PokerStars в 2009 году. Who won the 2009 WCOOP Main event? PokerStars holds the Guinness world record for the largest poker tournament ever held. How many players took part? Who was the captain of Team PokerStars Pro for All Star Week? November 15 saw the biggest Sunday Million ever held, what was the final prize pool? In 2009 PokerStars celebrated dealing 25 billion hands, in which month did this take place? Who won the 2009 PCA High Roller event? Which country won the 2009 World Cup of Poker? There was a remarkable feat of skill in Limit Hold'em in 2009. One player won the high and medium buy-in 6-Max events during SCOOP, then went on to win the full ring $1050 event during WCOOP. Who was this player? What was the total combined prize pool of the World Championship of Online Poker 2009? 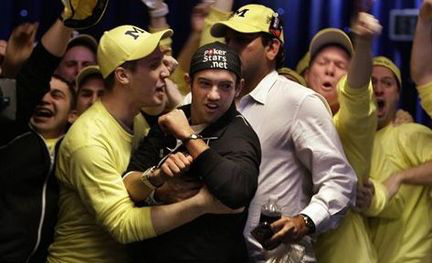 The players that qualified for the WSOP were offered bonus VIP Player Points (VPPs) for playing in the Main Event. How many VPPs were they offered? In July 2009, which well-known online tourney player set the record for the highest ever Weekly TLB score after taking down the Team PokerStars Pro edition of the Turbo Takedown? What is the nationality of Pieter de Korver, the Team PokerStars Pro that won EPT Monte Carlo? После завершения теста вас попросят указать имя своего аккаунта на PokerStars.